A typical data entry project team comprises of the following resources being involved. All teams report with the management team. For any individual project, a project manager is appointed underneath whom more than one team lead could be operating depending on the project size. 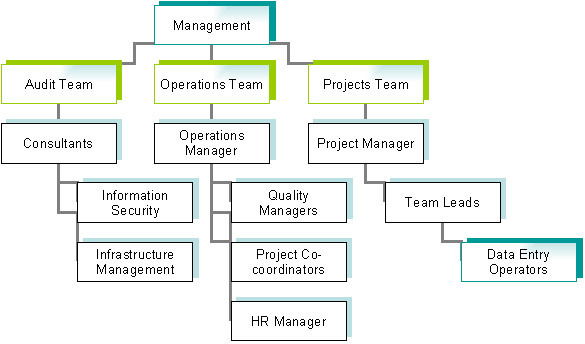 Project capacity management, quality control and issue management is jointly managed by the operations manager and project manager simultaneously. Communication protocols are established and managed through project coordinators and any additional skill requirement needed for extremely technical cases are handled using the consultant team. The HR team reports with the operations team to and thus any shortage of resources is immediately managed from their end. The entire organization of Data Entry India is hooked up like a neural network enabling smoother and faster handling of projects.